07 linhai 260 ignition switch wires? I bought a 07 Linhai 260 atv and electrical issue and has no power. It was missing a starter relay solinoid that I thought was going to fix it, but it didn't. I bought a new battery and a new ignition switch, and start kill switch. I noticed that the ignition switch has 4 wires coming out of the key side and then just plugs into 2 wire at the plug witch are the black wire and the red wire. The other 2 wires blue white strip and red black strip plug into nothing . So my question is where do they go. I've never seen one of these in my my life, so I know nothing about the accuracy of the diagram. It has the wire colors on the ignition switch that you specified. People do sell good *running* quads for good reasons. But non-running quads are usually sold because the previous owner tried to fix it and after a long hard battle gave up. Now you're stuck with the original problem(s), plus all the new ones the P.O installed while trying to fix it. I'll help as best I can, but I'm also trying to warn others about going down this perilous path. Back to the diagram: The power comes into the ignition switch on a red wire, and comes out on red/black wire (when the ignition switch is on). After going though a fuse in a fuse block it turns into a black wire which runs all the switched 12 volt stuff. It also goes back into the ignition switch, and when the ignition switch is switched to the headlight on position provide power to a blu/white wire that goes to the headlight switch. 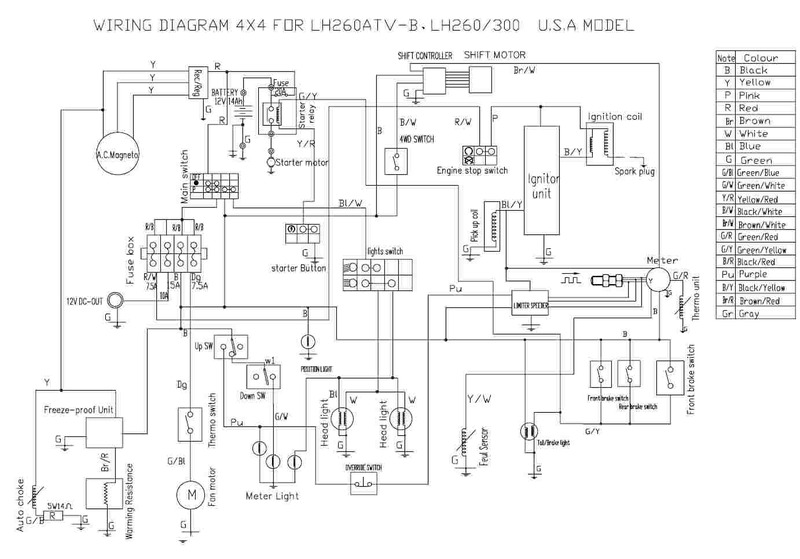 Follow the wiring diagram. See if the wiring diagram looks like your quad. Does any of this make sense? Note that the ignition system (according the to the unproven, unverified diagram) also runs off the red black (switched 12 volt DC power) wire going to the fuse block, but through a different fuse than the headlights and other ancilllary DC powered stuff. Got your meter warmed up? Damage to my Baja 150 by reversing battery polarity ? Quick Reply: 07 linhai 260 ignition switch wires?